PORT-AU-PRINCE, Haiti – When longtime Los Angeles resident Wilberle Vereus arrived in Haiti after being deported from the United States, he was taken to the Petionville jail above Port-au-Prince and placed in a 20-by-10-foot cell along with three other deportees and a group of Haitian prisoners. 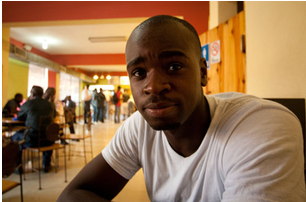 Wilberle Vereus, 22, at a Port-au-Prince restaurant one month after he was deported to Haiti. One deportee to Haiti who arrived in April suffered from asthma, hypertension, diabetes, bipolar disorder, posttraumatic stress disorder and head trauma, among other ailments. That same month, the U.S. deported a mentally ill immigrant whose psychiatric medications were lost by Haitian authorities after his first day in jail. "What’s distinct about the situation in Haiti is that, unlike in other countries, people are immediately jailed, and the conditions in Haitian jails are condemned universally for violating human rights," said Rebecca Sharpless of the University of Miami Law School Immigration Clinic, which helps immigrants appeal deportation orders. "They never talked about deportation - they were Americans. It was a subject that never came up," Vereus said. "I never thought I could get deported because I was a legal permanent resident. I’ve been in the U.S. so long, I never thought deportation would ever be a problem." Wilberle Vereus of Los Angeles prepares to be fingerprinted shortly after arriving on a Sept. 13 deportee flight to Haiti. "We don’t give them any medicine," Casseus said, adding that the International Organization for Migration, which works to improve living conditions in Haiti, attends to the health needs of jailed deportees. But a spokesman for the organization said Haitian officials do not allow access to the deportees once they are in jail. Haitian authorities immediately imprisoned him - without charge - in the same cell where Vereus later would be held. Dorne's illness required him to take four medications daily, so U.S. immigration officers sent a one-month supply of the prescriptions to Haiti's judicial police. But jails in Haiti do not have medical personnel, and Haitian police are not trained in basic medical care. "The prescription said every night. So Saturday night, I asked the chief officer, 'Can you get my medication for me?'" Dorne said. "They told me they can’t find it. Every day, I asked them for it. After two, three days, I stopped asking." "I couldn’t sleep," he said. "My hands started shaking." In April, a mentally ill Haitian immigrant in Miami had his deportation deferred on the grounds that the conditions in a Haitian jail could meet that standard in his case. Haiti's Citizen Protection chief Florence Elie, an adjunct member of the commission, said the detentions are meant to allow authorities "to get to know them." Lizius was deported on the first flight to Haiti since the earthquake and was jailed for 11 days upon his arrival. For now, he spends most of his time in his sister's Port-au-Prince home underneath the flight path of Toussaint Louverture International Airport – listening to the rumble of planes leaving for a country he called home. "I had my first love, my first crush in the States. Went to school, kindergarten, middle school, high school, college in the States. First job in the States... All I know is the States." Like Lizius, Vereus said it is challenging to adjust to life in a foreign country. "I really don’t go anywhere – I just talk on my phone. I might walk around the corner and buy something to drink or something, but I don’t know nobody," he said. But for his California family, there is little consolation. Because Haitian authorities forbid Vereus from making a phone call when he arrived in Haiti, his family didn’t find out he had been deported and jailed until a reporter contacted Fritzner the next day. "I told my mom, but she fainted and had to go to the emergency room," he said. "I had a heavy heart for a couple days knowing that she’s gonna suffer."